I scoop a pile of all-purpose flour into the shape of a small, soft, moveable mountain. The front fingers of my left hand curve gently inward making a loose fist that I dip into the center of my creation. I push the walls of flour further outward in a slow circular motion to make a crater or a nest depending on how you look at it. Outside the birds are chirping. The sun spills in across the worn and scratched surface of my countertop. Eight or so eggs in hues of soft blue, green and umber from my neighbor’s chickens sit in front of me, a bottle of olive oil to the side. I pick up a blue egg, crack its shell on the counter and split it open. Its contents fall inside the crater. I follow suit with three more before tossing the white of the fifth egg, and plopping the yolk in with the others. Add the salt, and the oil, and the base of dinner for at least two nights sits before me. 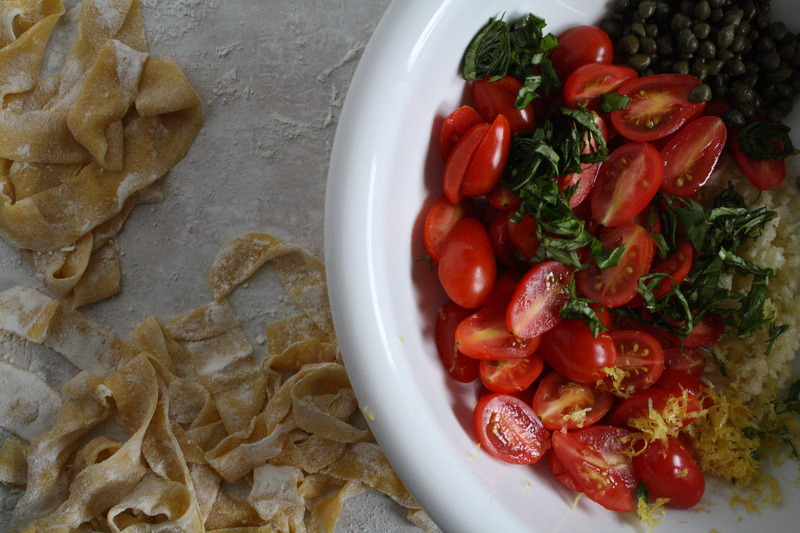 Today, these ingredients will become pasta. 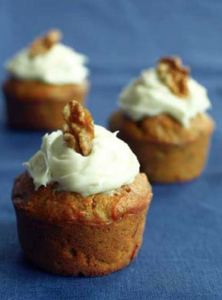 Vary the amounts, add some sugar, and a stand mixer and the raw ingredients transform into cake. Today, I am a mother of two school aged children working alone in a quite house. Not long ago, I was a mother of children in diapers, trying to keep them out of the flour and the Tupperware drawer. 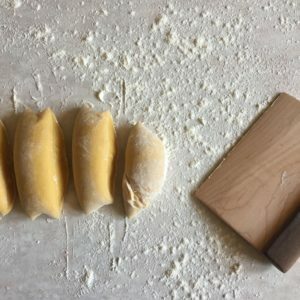 Here in the quite of my kitchen, eggs, oil, and flour will become pasta dough, rolled out with the same rolling pin that has made endless cutout cookies at Christmas and tenderized the flesh of countless chickens. This weekend we celebrate Labor and the end of summer. It marks a transition in how we will spend our afternoons as the nights grow longer and the days cooler. Soon we will hear about pumpkin spice everything, and the grocery store aisles will be stocked from floor to ceiling with Halloween candy, even though fall has yet to arrive and Halloween is still two months away. I will not be hurried or rushed, so I make dough, and daydream about transformations. Dough must rest or rise there is no escaping the time needed to develop gluten and structure. Like people, it takes time to grow a backbone or become elastic. One is not exclusive of the other. I, along with thousands of others, traveled to the center of Nebraska to see the total solar eclipse. I took the kids out of school.My sensible and reserved husband, wasn’t as excited as I was so he stayed in Omaha. I packed my children, whose faces were still puffy with sleep, into my dusty Toyota and followed my brother’s car, two parts of caravan of friends and family. We drove for two hours down country roads until we found a spot near a lake where we set our picnic blankets and sandwiches alongside other eclipse pilgrims. We waited, and watched as the sun became an orange sliver. It was interesting, and beautiful, but not overly impressive. Then we stood in the shadow of the moon, a silver ring glowed around it, and the entire world as we saw it transformed into a living Maxfield Parrish painting. We were awestruck. My brother yelled, “Lets run up the hill!” Though we are both in our 40s, we ran like children to the top, clomping through the dried remains of prairie grasses and rosehips. His wife and my children ran with us. The moon covered the sun, and a cacophony of sounds emitted from one hill top to the next. We applauded. We laughed joyfully. We were bathed in midday darkness, then soft light. We had a shared collective experience of beauty. These shared experiences are more important than I have given them credit. We build on them socially, they provide structure. They create our backbone and elasticity. Without them we are just random bits of cells floating around bumping into each other but incapable of connecting, incapable of building. We exist as mere fragments of what could be a much deeper, broader and complete existence. I can’t comprehend the vast natural wonders in the world any easier than I can compartmentalize its villains or heroes. I have been both in my lifetime, and so have you. The wonder I have with every human connection, and the loss I feel when it’s absent live in the valley between two hills and the grade is steep when climbing either side. I am as easily exhausted as I am exhilarated. I am weakened and strengthened by the same experience. I knead the dough, pushing the heel of my palm into it, and folding it over, again, and again. I’m not too gentle, but then again transformations rarely are. I developed this recipe when my son was four months old. He wasn’t sleeping through the night and we were both fussy. I missed good, healthy food, so I came up with this quick, fresh dish. The sauce comes together in just a few minutes. I will freely admit to buying noodles at the store when he was an infant. He’s older now, so I make noodles from scratch. 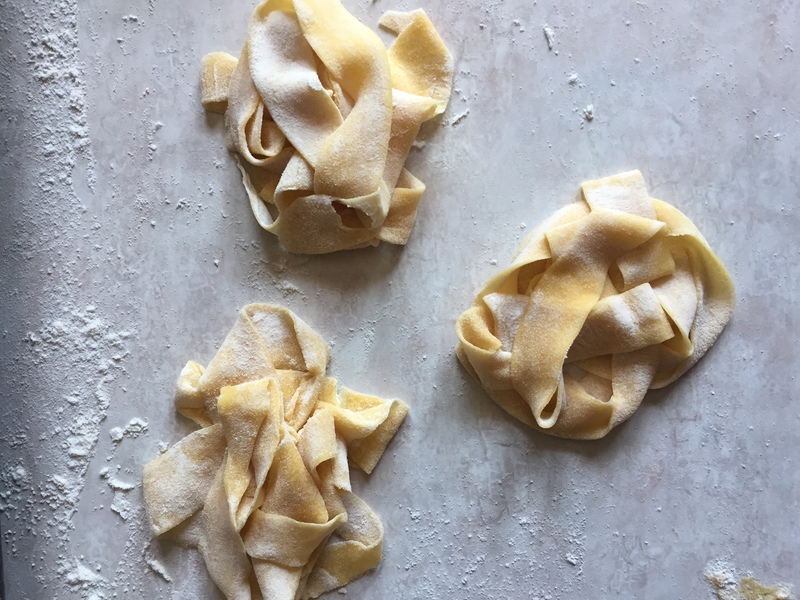 If you’re short on time, buy pre-made noodles, but if you have the time the flavor and texture of homemade noodles are worth the extra effort. Start a large pot of boiling water. Season with a good amount of salt and olive oil. While the water is coming to a boil, combine everything except lemon juice in a bowl large enough to eventually accommodate the noodles. Give it a quick toss and set aside. Once the water comes to a boil add 6 oz of fresh pasta and cook for about 2 minutes. Toss genly with a fork a time or two so it doesn’t stick together. If using store bought pasta, cook to package instructions. Once pasta is finished drain and put noodles into the bowl with the sauce. Squeeze lemon juice on top. Toss until everything is well coated. 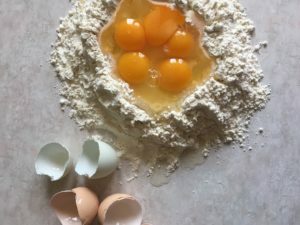 Heap flour into a pile on the countertop. Create a well in the center. You want the flour to resemble a volcano. Place the eggs, yolk, olive oil and salt into the well. Working from the inside of the well out, use a fork to slowly make a stirring motion from the center of the well, breaking the yolks and pulling in bits of flour as you go. 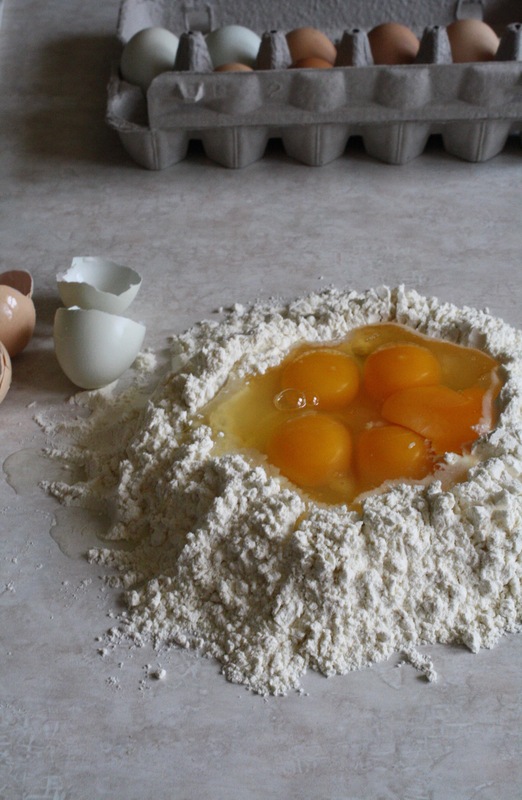 Do this until you gradually combine the wet and dry ingredients until the dough somewhat comes together. Use your hands or a bench scraper to continue to bring the dough together. Form it into a ball, dust a clean part of the counter with flour and knead for 10 minutes. If the dough is sticky add more flour a little bit at a time. You should have a soft, elastic dough. Wrap the dough with plastic wrap and let it rest on your counter for an hour. When it has finished resting. Shape it into a fat log, and cut it into 5 or 6 sections. Leave one section out and rewrap the others. On a well-floured surface, roll out the dough into a long strip, that is just about paper thin. 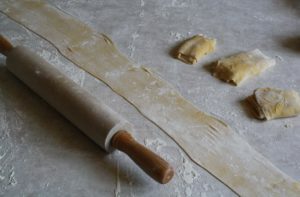 I use the rolling pin to lift the dough up, re-dust the counter and flip it over with each pass. 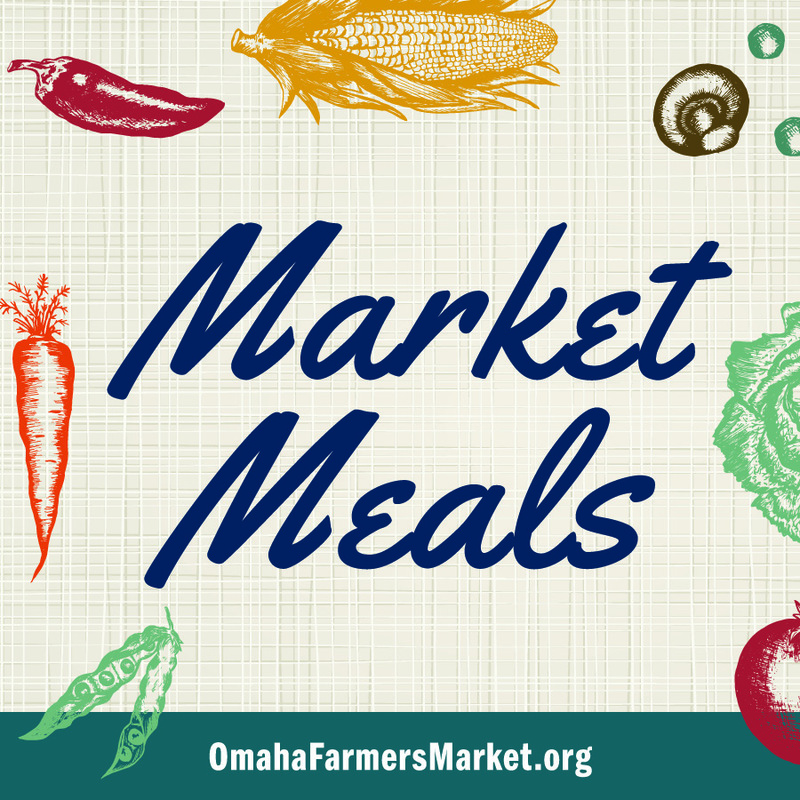 When you’re finished, you should have a long piece of dough that is 3 to 4 inches wide and a yardstick long. Dust the strip of dough with flour. Starting with the short end loosely fold it over itself a stack. Then cut the stack into 1-inch wide strips. Repeat the process with the rest of the dough. Unroll the individual noodles and stretch them across your dining room table or kitchen island. Let dry for about 45 minutes to 1-hour. The noodles will still be pliable, but should be dry enough that you can create little nests without compressing the noodle. If saving for later, place the noodle nests on a well-floured baking sheet, then place in the freezer. Once frozen, transfer the nests to a plastic bag. 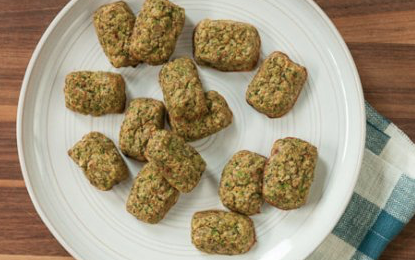 If you are really pressed for time, you can pile them into the little nests on a well-floured baking sheet, without first drying them. It will still work, but some of your noodles might be compressed. 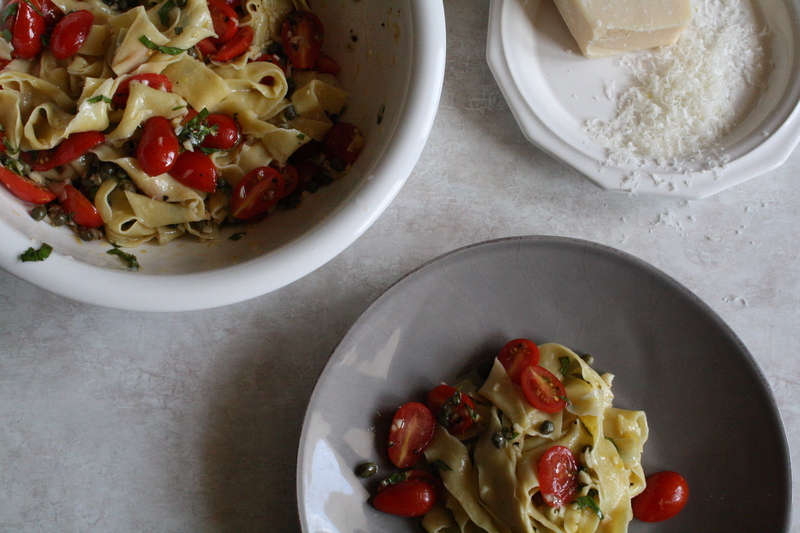 Bring a pot of salted water to a boil, add a tablespoon of olive oil to the water, and fresh or frozen pasta. If fresh it should only take about 2 minutes to cook. If frozen, it should only take about 3 minutes. 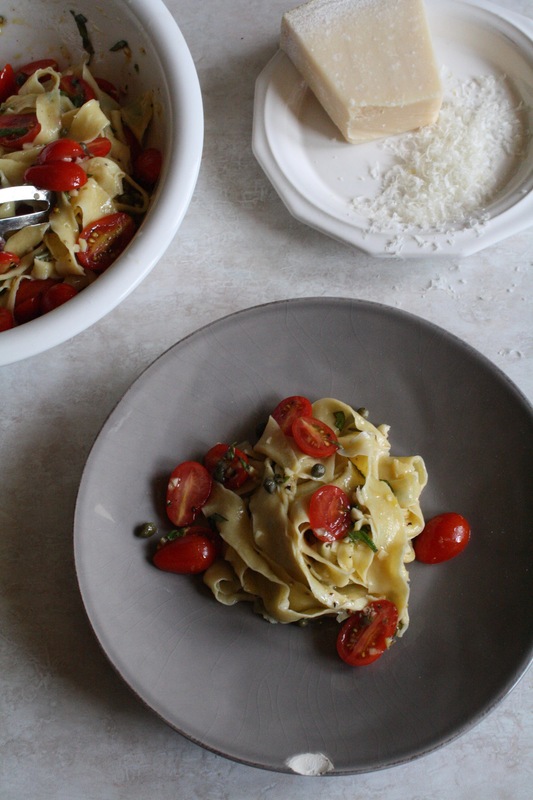 Drain the water, and use noodles with the 10-minute pasta sauce. I woke to find the air misty and damp. It was early March and the sun had yet to rise. I stayed in bed for a minute as blue light settled on the surface of my nightstand, and across a stack of unread books. I took a deep breath to release my pessimism, and assess my 38-year-old body still soft from birthing a baby four years earlier. I wondered if I could handle a rainy, hilly, 8-mile hike. I wondered what business I had trying. My back has fallen down on the job. It has chosen not to support the structure of my body, which means I cannot engage in high-impact activities. I watch my children bounce on trampolines from the sidelines, and wave them goodbye as their little feet crunch the gravel road on family runs with my husband. On this morning, however, I was going to try something new. Something outside walking the lowest speed of a treadmill, and engage with the world in a way that made sense to me. I was afraid I would fail, and it would be solid proof that I would never regain the health and athleticism I once knew. It was time to confront fear with action, however, and if I slid down a muddy ravine or reinjured my back, then so be it. I put on the only hiking “gear” I owned — a pair of jeans, some old tennis shoes, and my winter coat, which was much too warm for the day, but it was my only waterproof jacket. Just shy of an hour later, I arrived at Fontenelle Forest in Bellevue, Nebraska. A smiling, 20-something, refreshed looking, natural beauty goddess, fit enough to scale a mountain wall greeted me. “Yes,” I said as she gave the person at the front desk a ticket. The hikers stood in an awkward and misshapen circle, smiling and casually avoiding eye contact. I found another poor soul who had to pile on winter clothing to keep dry. In his case, it was a ski suit complete with poles. “Ok,” I thought, “I’m not the only newbie here.” It was comforting and maybe he felt the same way when he saw me. It took a bit of courage for me to get up that morning, but I knew instantly I’d made the right decision to put my frumpy body in frumpy clothes and meet those people in that place. I wasn’t trying to break a world record. I was trying to break a habit. I had walled myself up and surrounded myself with comfortable things, people and experiences. I was trying to remember what I was like and who I was when I challenged my body and took risks. In the big scheme of things, it was a small moment, but those unsung decisions have a way of changing our lives. I honestly don’t know why I signed up for that hike. I just know I was absent mindedly scrolling through Facebook when the event popped up, and I hit yes, I will attend. One hike 2 years ago has led to exploring fifteen different parks, and recreational trails in Iowa, Nebraska and South Dakota. It has been the motivation for family camping trips, mom and kids camping trips, and one cherished weekend with some close girlfriends. I have found something to challenge me personally, serve as quiet meditation or some much needed quality time with people I love, and it’s all thanks to the day, I woke up and put on a winter coat in March. 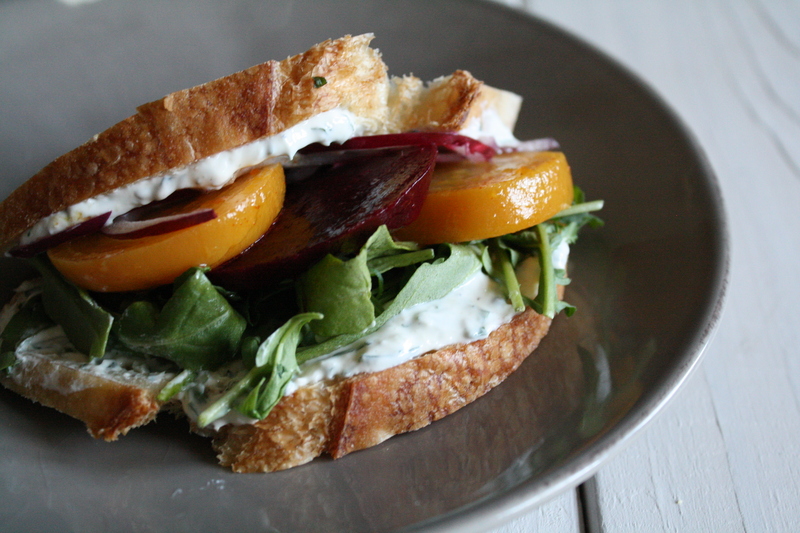 Orange and beets are a classic combination, but they aren’t in season and I wanted this sandwich to use a recipe I already shared with you, Peach Basil Jam (Click HERE for recipe), in a new way. 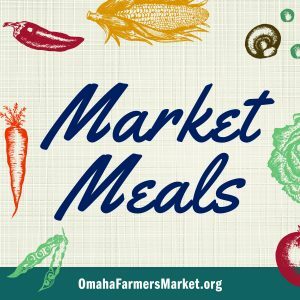 Of course, if you don’t want to make peach basil jam from scratch you can buy peach jam or apricot jam and add basil leaves to it. It’s cheating, but not everyone is into making jam, so go ahead and buy peach jam from someone who is into making jam, then add 1 tsp of thinly sliced basil to a ¼ cup of it. It will make you both happy. Heat oven to 400 degrees. Trim beet ends and tops, but don’t peel them. Wrap in a foil pouch with about ½ cup water. Place pouch in roasting dish with lid, and roast in the oven for 1 hour. 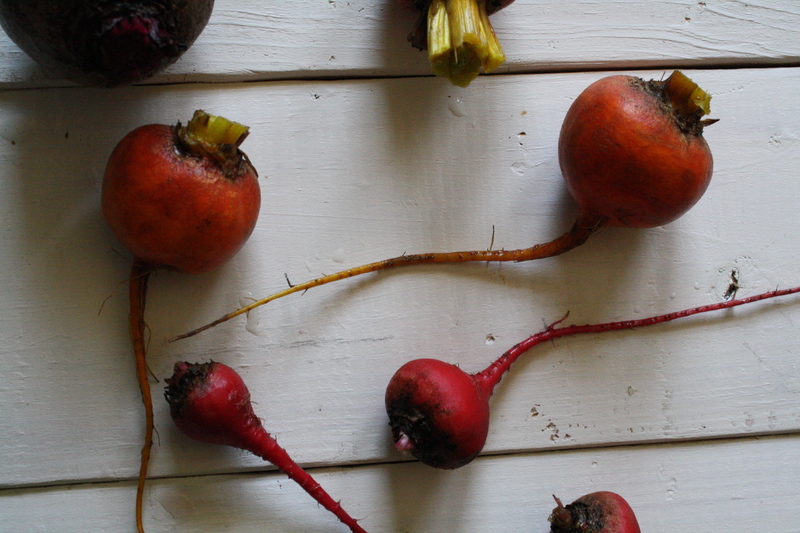 It could be more or it could be less depending upon the size of your beets. 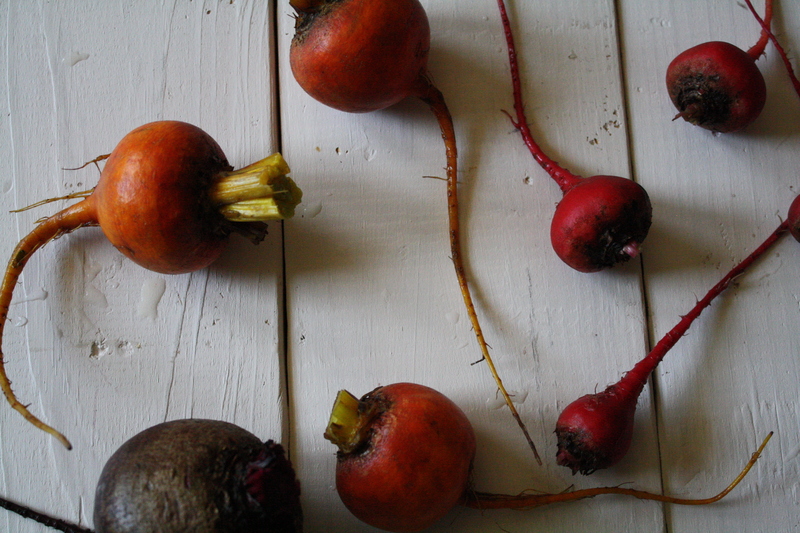 While the beets are roasting make your vinaigrette. 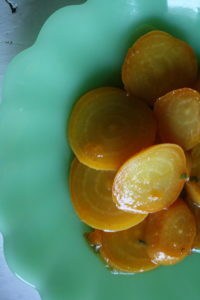 In a medium bowl, whisk together all the vinaigrette ingredients. 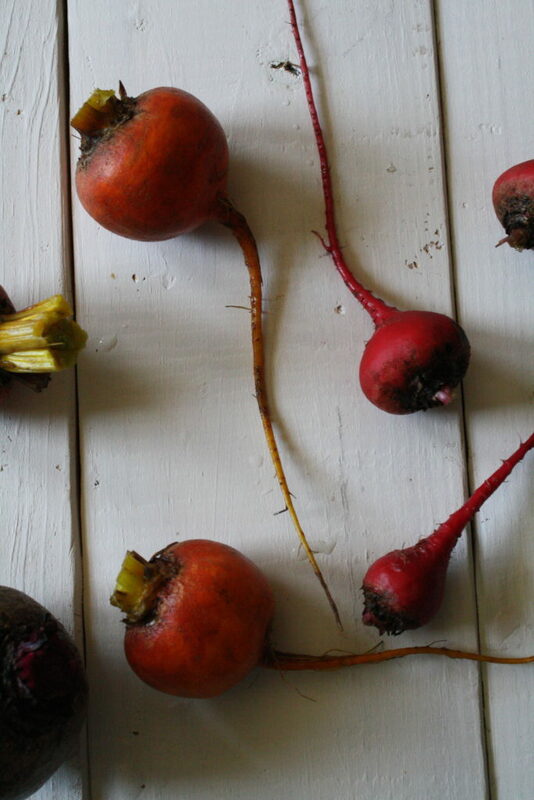 While the beets are still warm, but easy to handle rub the skins off with a paper towel slice them like you would slice a tomato for a BLT, and add them to the vinaigrette toss to coat. In a small bowl combine all of the ingredients for the sandwich spread. Slice your bread. Toast it. Spread 1 tablespoon of sandwich spread on each slice. 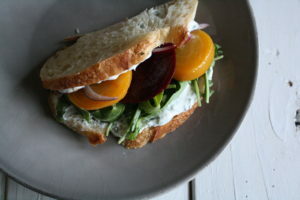 Top with arugula, 3 to 4 beet slices, thinly sliced red onion, and remaining slice of bread. Note: You will have beets leftover because there is no point in turning your oven only to roast enough beets for a sandwich. Have a few leftover and add them to a salad. Thin leftover sandwich spread with a little cream, and use it as a dressing, or don’t thin it and use it as a dip for other vegetables.